Spring is blooming, more brightly and beautifully than ever before:bouquet effect and jeans style, for a romantic and very feminine make-up.The focus is on the eyes, satin, pure and elegantly drawn with eye shadow in pastel nuances. A sparkling eyeliner completes the look, creating a brand new “contrast” effect that lights up the eyes. 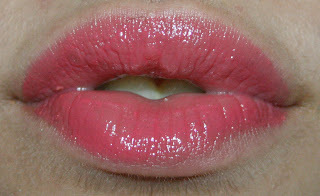 On the lips, flirty and shiny shades, that enhance the volume with a crystalline effect. Cheeks are delicately colored, for a luminous matt finish with a natural “bonne mine” effect. Ultra glam shades color the nails, for a perfect Jeans N’Roses total look. Last month us Maltese bloggers had our very own first bloggers meet up and were lucky enough to have a press meeting with Pupa Milano (malta)'s PR Stephanie Zammit, who showcased the new spring collection from PUPA MILANO called Jeans N'Roses. We had a lovely meeting with her, as she explained the reason behind the spring collection as it was based on florals and jeans which is the current trend for spring/summer '12. After the little demonstration where we all could test and try out the products she kindly let us pick out items from the line to keep. I personally have never tried PUPA MILANO products but have heard alot from friends who love the brand. I decided to go for the soft green eyeliner as i love using these in spring summer to change up to give some colour to the eyes. They are soft and very well pigmented with some glitter particles and the pigmentation lasts a long time in the inner rim of the eye which is a plus to my books! Shade 02 called Peach Rose is a lovely moisturising lipstick which gives you a sheer to medium coverage in pigmentation yet softens the lips. It does however has a vanilla scent so for those who cannot stand those weird smells with lipsticks, you are going to love these! Reminds me of a MAC Lipstick very mositurising and very sleek. After my experience with this lipstick i will be heading over to a counter to try out more shades. With shade 03, the grey silver is a lovely light shimmery taupe with a hint of brown tones. Being its a baked eyeshadow you can easily use these either dry or wet to enhance the look. Very pigmented and long lasting on the lids just always remember to use an eye primer for it to last longer as it will show up more true to colour on the eye lids. I cannot say anything else but OH MY GOD! The pretty design in this red compact is beautiful, i must admit out of the whole collection these duo's have been my favorite. The compact is basically filled with a lovely design of roses and a highlighter in the middle of the combo with a strong fragrance of pure vanilla essence that makes you wanna leave the compact open all day near you. You have a mirror inside the compact which makes these duo's easy to carry and travel with you. 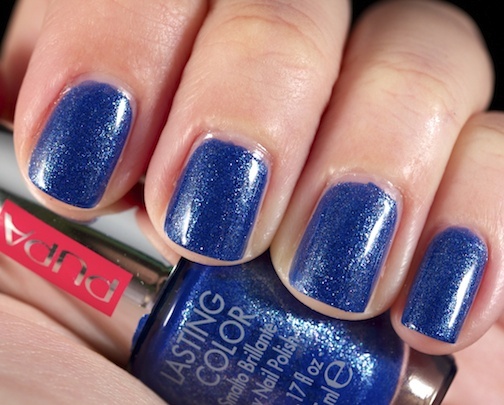 The gorgeous blue glittered nail polish that is a must for this season. Not navy not light pastel but a perfect sea blue shade fantastic for this spring/summer 2012! Long Lasting with amazing pigmentation all around. Doesn't Chip easily either which for the price of €5.60 you cannot go wrong readers! I am very happy to have been given the opportunity to try out the brand. PUPA MILANO stand out with the Bold Red packaging making the products stand out and looking sleek and profesional. The vanilla scent in their products show that they arent a cheap brand with a cheap plastic smell but instead show that they are very well aware that they want their products to be as good as high end brands even though they are a drug store brand. I recommend anyone who hasn't tried their products to go have a look at the collection and other products by them. What is your experience with PUPA MILANO? Have you tried any of their products? DISCLAIMER: These Products were kindly given to my by a PR for PUPA MILANO MALTA. Anything written in this post is based on my honest and unbiased opinion and not influenced by others. All products shown have either been purchased by me and/or family or friends. or products sent for a review purposes.